Popular children's show Rainbow is to return, 14 years after it was taken off TV screens. The series, which featured George the hippo, Bungle the bear, loudmouth Zippy and human pal Geoffrey, will be repeated by digital channel Nick Jr.
Rainbow, which also featured singers Rod, Jane and Freddy, was screened by ITV from 1972 until 1992. Re-runs dating from 1982 will begin on Monday as part of the channel's evening nostalgia programming. The show mixed comic storylines featuring the four main characters, as well musical interludes by Rod, Jane and Freddy and quirky animations. 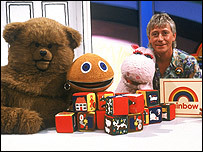 Stanley Bates, who played Bungle for 17 years, said the revival was "great news". "The show is very indicative of its time," he said. "You couldn't make a modern version quite the same." A Nick Jr spokeswoman said the channel had bought up the series because it remained "fresh and funny". During its run, the cast members included Matthew Corbett, who appeared in other TV shows featuring Sooty, the puppet created by his father Harry. The show was created to help fill daytime schedules when broadcasting hours were liberated in the early 1970s, but was cancelled when production company Thames lost its ITV franchise. Short-lived attempts were made to revive the Rainbow characters in the 1990s, but in different formats.